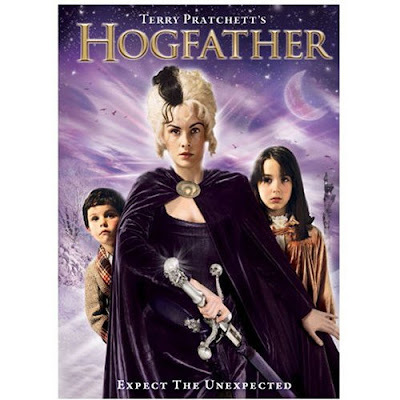 Today's movie is: The Hogfather - Part 1 (chosen by the Small Person) which by the rules of sequels in our little countdown means that tomorrow will be part 2, no selection necessary. 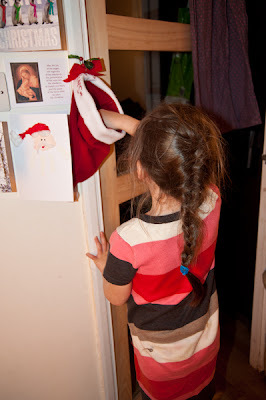 In case you were wondering how we choose our movie, we have this little Santa hat pinned to the doorframe filled with little gold and silver cards with all the movie names on. When we've watched a movie, we pin the card to the wall next to the TV. 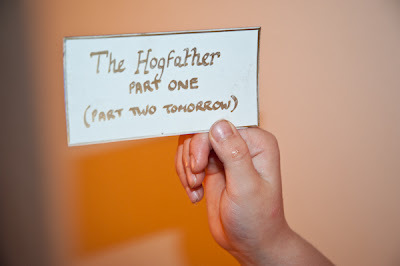 First of all drawn a circle on a your stiff card. 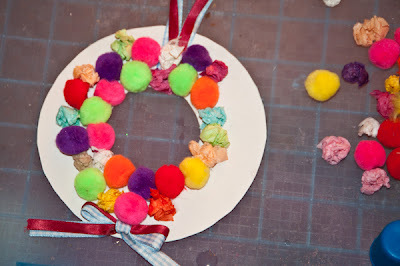 (remember the bigger your circle, the more pom poms you will need to complete the wreath). Draw a smaller circle inside the other one leaving at least a 2.5" gap (this again needs to be down to your own judgement. The bigger you have made your original circle, the wider the gap will need to be to look right) You may want to look at the ring we made for our autumn leaf wreathes at Toddler Group here. 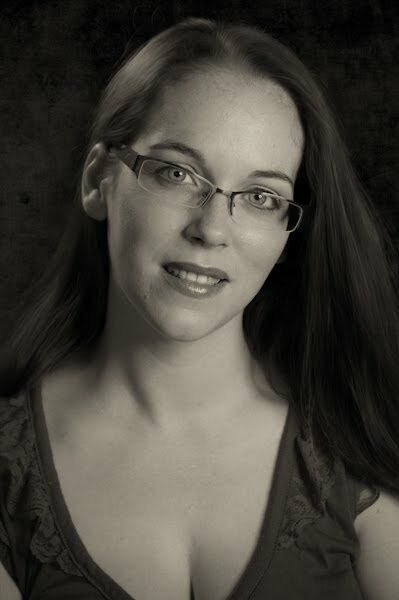 Cut out so you are left with a ring. 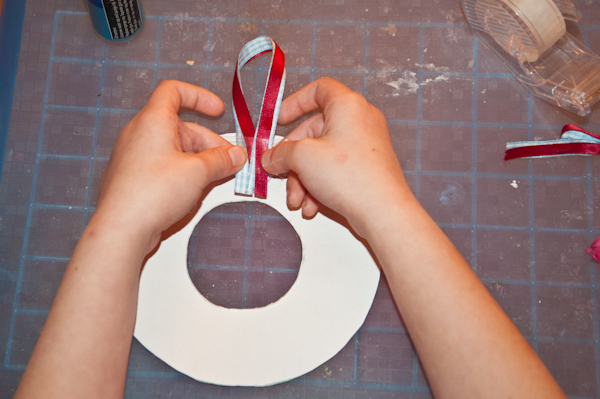 Create a loop with the ribbon (for hanging) and fix to the top of the ring with tape. (this will be covered with pom poms. Next, you just have fun sticking pom poms all over your ring. Make sure not to leave any gaps. 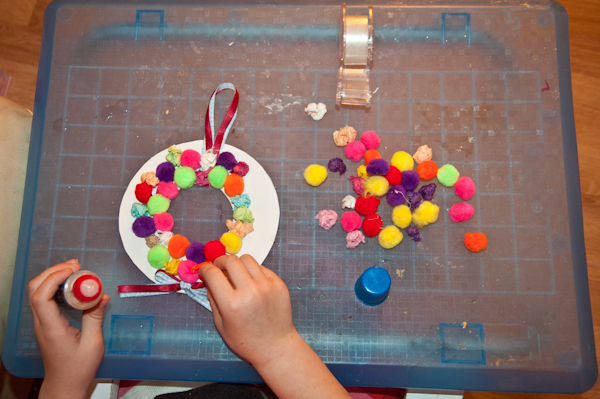 You will find homemade pom poms much easier to stick that craft pom poms. I usually find putting glue on the craft pom pom rather than what I'm sticking it to, and letting it soak into the fibres a bit, helps to get them to stick better. 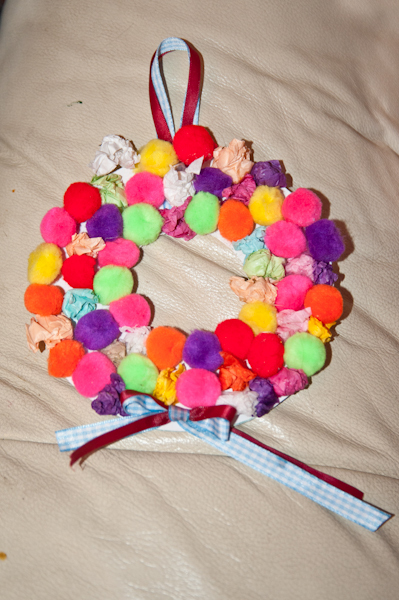 We have also mixed in some coloured scrunched tissue paper balls and a bow at the bottom. 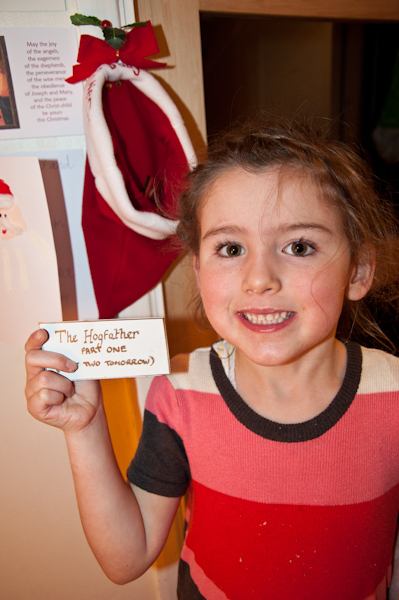 This will hang on the small person bedroom door for Christmas once it is dry. 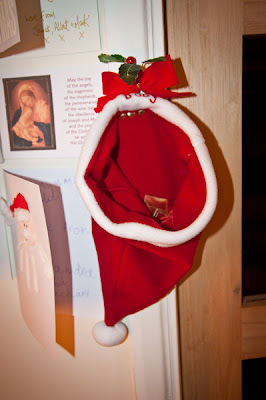 This is a great craft for Christmas with kids and is really easily adaptable to other things. 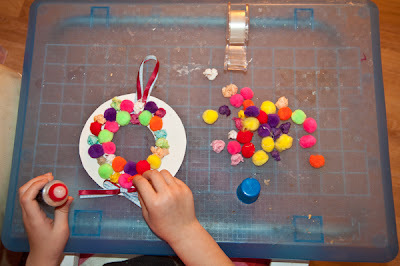 You could stick felt shapes all over, scrunched up tissue paper (we have done this with toddler group before), buttons, paper/fabric flowers, foil (it would look especially effective with foil milk bottle caps) and plenty of other things. You could actually do a combination of these items to make a really lovely full wreath. it would also be nice to add a big bow at the bottom (or just a tiny one like the Small Person's). A final finishing touch would be a scroll of paper across the centre with a festive message or your child's name. 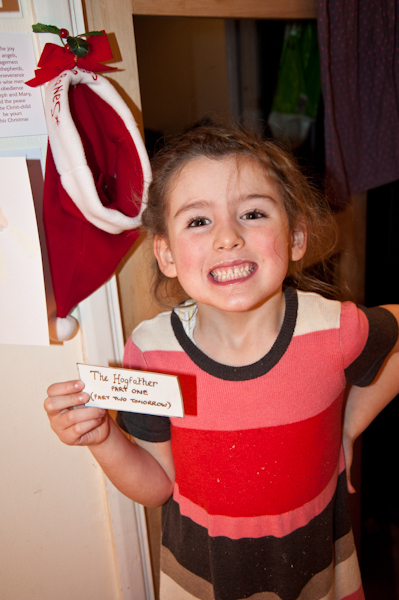 Just take a strip of paper about 2 inches in depth and a little long than the width of you wreath. Write or print your message (you could even use letter stickers) then take a pencil and curl each end around the pencil to scroll the ends. 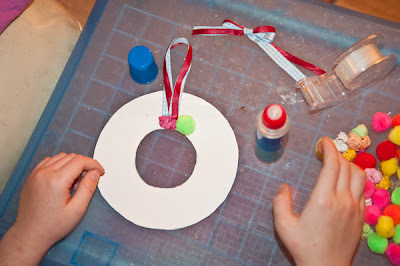 Glue in place across your finished wreath. Only 18 sleeps 'til Christmas!